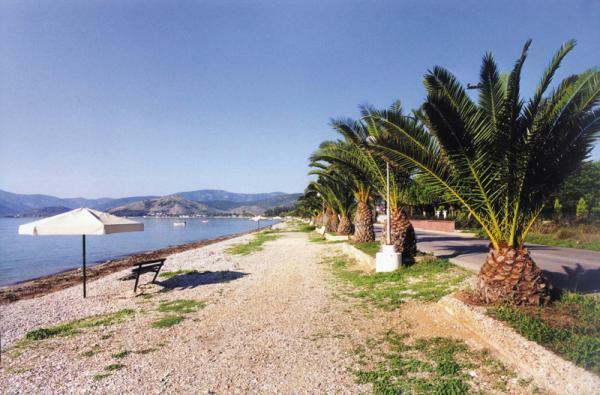 Type: A lengthy beach, with both sand and small pebbles, crystal clear waters and even palm trees. The seaweeds in the sea are an indication of healthy clear waters. Location: About 6 km. south of Argos. Access: By your own means of transport or by public transportation. Facilities: There are changing cabins, showers, parasols, hygienic chemical toilets and parking spaces. There is also a variety of water sports available. Of special interest: Recently a promenade has been built, offering the public an alternative walk by the sea. It is a 500 m. long pavement for both walkers and cyclists, constructed all with natural materials.